Lionsgate truly pushed the envelope with this release of Allegiant creating I dare say one of the best audio mixes I have heard to date on a 4K disc. Anytime there is a popular book series these days, it is a given it will be made into feature films; and Veronica Roth's Divergent books are no exception. 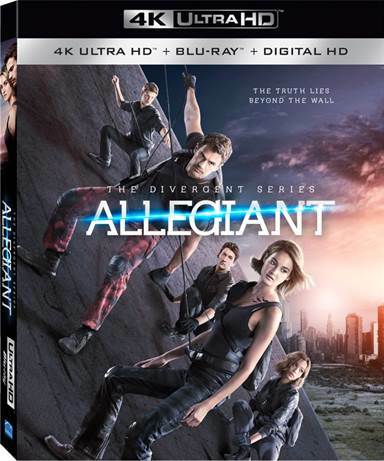 Allegiant is the third film in the Divergent franchise, and it makes its way into stores on 4K Blu-ray, Blu-ray, and DVD on July 12, 2016. In the film, we see Tris (Shailene Woodley; The Fault In Our Stars) and Four (Theo James; Underworld Awakening) continuing their battle after finding out that there is, or was, life beyond the wall. Once the news hits, Evelyn (Naomi Watts, Birdman) forbids anyone to venture outside the wall; but when Tris, Four, and others disobey her, they find something that seems like it is the answer to their salvation. But is it? If you are a Divergent fan, then I would absolutely say that you need to see this film -- simply to see the continuation of the franchise before the final installment heads to theaters next year. And, if you already took the time to see the other two, then this is a must. I have to say, however, I found this film to be a bit lackluster. Part of the issue which makes the movie drag is the splitting of the last book into two films. It wasn't really necessary when they could have condensed them into one, and maybe had more of an exciting finish. Back are the actors that the audiences fell in love with -- including Woodley, James, Watts and Ansel Elgort (The Fault In Our Stars), and Miles Teller (Fantastic Four). They all play their roles nicely, although Woodley seems a little more stiff and wooden in this installment than she had previously. Joining them, is veteran actor Jeff Daniels (Dumb and Dumber), who adds a fresh element to the dynamic of the group. Presented in 4K UHD, the Allegiant film never looked so good. While not true 4K, it is pretty close. Presented with 2160 lines of resolution, I dare say that Allegiant looks better than it did in the theater. Colors are vivid and spot on as well as the black levels. Unfortunately, one downside of 4K presentations, is that low-res-rendered special effects will stick out like a soar thumb; and they certainly did with this film. The fact that the other scenes look so beautiful makes those low-res shots even more of an eye sore. The audio presented in Dolby Atmos/TrueHD 7.1 uses the full audio spectrum to help tell the story of Tris and Four. Dialog is crisp and clear, and special effects used all the speakers in the room. The battle scenes were enhanced when listening to shots and people coming at you from every different angle. The soundtrack was subtle and not overwhelming. Lionsgate truly pushed the envelope with this release creating I dare say one of the best audio mixes I have heard to date on a 4K disc. Included with the 4K UHD disc, is a Blu-ray copy of the film, as well as a Digital HD one as well. To give the best possible video and audio presentation the Special Features are all contained on the Blu-ray disc in the set. Features include a Audio Commentary with Producers Douglas Wick and Lucy Fisher, Allegiant: Book to Film, Battle in the Bullfrog, Finding the Future: Effects and Technology, Characters in Conflict, The Next Chapter: Cast and Characters, and Building the Bureau. Unfortunately, like the film itself, the extras were somewhat underwhelming. If you are a fan of Roth's book series or these talented young actors you will no doubt enjoy the third of four films in this franchise. However, if you don't particularly like young adult novels or sci-fi genre themed movies, this is one you probably want to skip. Overall, this was just a holding pattern for the real drama to come in the conclusion movie out next year. Download The Divergent Series: Allegiant from the iTunes Store in Digial HD. For more information about The Divergent Series: Allegiant visit the FlickDirect Movie Database.